The Five-Pound Secretary - An illustrated history of the Blickensderfer Typewriter. Available now through our online bookshop. 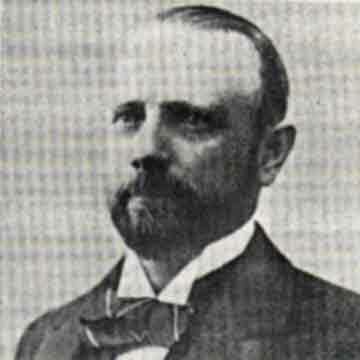 George Canfield Blickensderfer was born in Erie, Pa., in 1850. At the age of 10 he attempted to build a flying machine, which, had it been successful, would have made him ultimately more famous in the world than he is today. But as a grown man he invented other mechanical marvels that did succeed. The first was a store carrier service that could transport packages and money from different store counters to a central packing station and back. George Blickensderfer spent much time traveling by train while pursuing his conveyor business. He realized the need for a portable typewriter so that businessmen could type letters and invoices while traveling on the train or while in their hotel. When he was in his 30s, George Blickensderfer, now married to his wife Katherine, moved to Stamford, Conn., where he built his first typewriter in a little workshop behind his house on 88 Bedford Street. George's first patent for a typewriter in 1889 was his basic invention for a typewheel machine operated from a keyboard. Such a design eliminated the numerous type-bars and their mechanisms that connected them to each key. This saved costs and weight. It weighed about a fourth that of typewriters of the time. George developed several models of his typewriter before he considerded it ready for production. No examples of the first four models (images of the models 1 and 3 are in pics 2 and 3) are known to exist, but Model 5 (see collection) was built by the thousands. The machine was presented in public for the first time at the 1893 Columbian Exhibition in Chicago, where George's attractive red-headed secretary May Munson (pic 4) drew large crowds as she typed away at great speed on this wonderful little machine with its fascinating typewheel. Other typewriters companies are reported to have closed their booths early, as George brought in hundreds of orders, including his first export deals. The export market was important for the Blickensderfer typewriter company from the very beginning. The machine was sold to England, Germany, France, New Zealand and Canada to begin with. One of the strong points was the interchangeable typewheel that was produced for many different languages, including Slovak, Armenian and Hebrew. By 1896 he was producing some 10,000 machines per year. In 1900 George invented a breathtaking electric typewriter (pic 5) that in functionality and speed was not matched until IBM introduced the famous golf ball model half a century later. Although the machine was advertised, sales never got off the ground and only three samples of the Electric are known to exist today. World War I was a heavy blow for the Blickensderfer export market and the company almost went under. However, George invented a device to feed cartridges into machine guns along a belt. Again, he signed a tremendous export order and sold the device to the French government for several years. George Blickensderfer died after several weeks of illness on Aug. 15 1917.